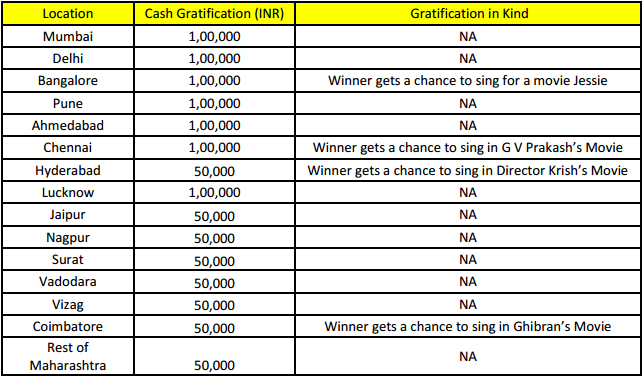 Win upto Rs.1 Lakh cash! 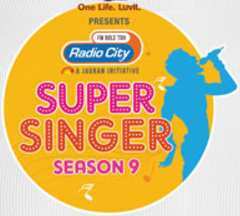 One supremely talented finalist will be crowned as Radio City Super Singer! "Radio City Super Singer – Season 9" is the Country’s Biggest Singing Reality Show which is sponsored by LuvIt as Title sponsor and powered by Go Cheeze. Participation can be through online registrations or the Ground Auditions. The last date to register is 11 August 2017. Interested candidates can participate in the “Radio City Super Singer season 9” by uploading their song in MBL owned website be 11 August 2017. Mode 1- Visit Radio City Office: Candidates can visit to Radio City office, at respective locations from 11 AM Indian Standard Time (ISD) hrs to 6.00 p.m ISD (Monday-Saturday), till 11 August 2017. Vizag, Hyderabad, Coimbatore, Chennai, Bangalore, Ahmednagar, Nagpur, Pune, Mumbai. The contestant obtaining maximum marks on the grand finale, followed by votes will be declared the winner of Super Singer. On the grand finale each finalist gets time for performance in the finals to be decided by the judges. At locations namely Chennai, Bangalore, Hyderabad and Coimbatore the winner shall get gratification in kind which is in addition to cash. Hyderabad Music Broadcast Limited Suite #.203, M.J Towers, 8/2/698, Rd #.12, Banjara Hills, Hyderabad - 500034. Coimbatore Music Broadcast Limited 1619, 9th floor, Cherraan Plaza, Trichy road, opp Kannan Departmental Store, Coimbatore - 641018. Chennai Music Broadcast Limited 3rd Floor, Citi Tower, 117, Thyagarajan road, T. Nagar, Chennai - 600017. Bangalore Music Broadcast Limited 4th Flr, Vakil Square Building, No. 56/3, Gurappanapalya, Bannerghatta Main Road, Bangalore - 560 029. Nagpur Music Broadcast Limited 4th floor, Mangalam Marvel, Nawab Area, Gokulpeth, West High Court Road, Near Pyramid, Nagpur - 440010. Pune Music Broadcast Limited D- wing, 6th Floor, vega center, Shankarseth Road, Swargate, Pune - 411037. Mumbai Music Broadcast Limited RNA Corporate Park, 5th Floor, Off Western Express Highway, Kalanagar, Bandra (East), Mumbai - 400 051.